The last step in finishing a part is to apply an appropriate finish. Deliverable: Removal of burrs and machining marks plus final surface finish. - Precision Grinding: In some cases, where high tolerances must be maintained beyond what the CNC machine is capable of, a precision grinding process using a surface grinder or cylindrical grinder may be required. - Deburring: Deburring involves not just the removal of burrs, but also the breaking of sharp edges. A variety of tools may be used including die grinders, deburring scrapers, files, and various stones. - Vibratory Polishing: This processes uses rotating or vibrating tumblers along with a variety of media to deburr, remove tooling marks, and even to polish parts. It's convenient because you can put the parts in the tumbler, turn them on, and go do something else. - Bead Blasting: This is a very popular processes that uses compressed air to blast an abrasive media at the material. 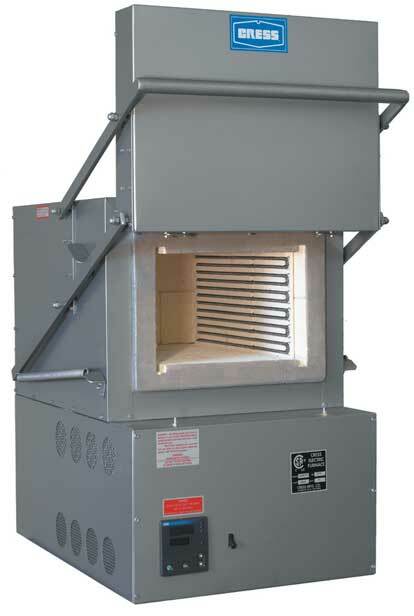 Bead Blasting is typically done inside a Blast Cabinet. - Filing: File work is something commonly taught to apprentice machinists. There is an art to using a file well, but a good file can be very efficient. - Stoning: Stones, often used in conjunction with some sort of oil, can do a good job deburring and knocking off edges. - Grinders and Buffers may be used. Belt Grinders, Disc Grinders, and stationary buffers as well as die grinders are all useful finishing tools. There are more tools available. In addition, it is often possible to use tools like Chamfer and Corner Rounding End Mills to do deburring right on the CNC machine. For a deeper dive into CNC Deburring and Part Finishing, check out our Definitive Guide to Deburring for CNC. Deliverable: Heat treatment of parts to make them harder. Heat treatment involves heating and then cooling metals, primarily steel, under carefully controlled conditions in order to modify the hardness of the material. An electric furnace is commonly used although metals can also be heated with a torch or any other heat source that gets hot enough. The key is controlling conditions well enough to produce the desired result. Care must also be taken that the part is not warped during heat treatment. In some cases, heat treating must be done before the part is completely finished so that any warping can be machined back out again. Deliverable: Application of various coatings to improve the appearance or function of parts. - Anodizing: This process uses electricity and chemicals to apply a coating. - Parkerizing: Another process commonly used on firearms. - Bluing: This is a process common on firearms that is used to create the characteristic blued finish on steel. - Plating: Chrome plating, nickel plating, and other kinds of metal can be applied via plating processes.